April 1941. The terrain indicates that this picture was probably taken in Yugoslavia or Greece. 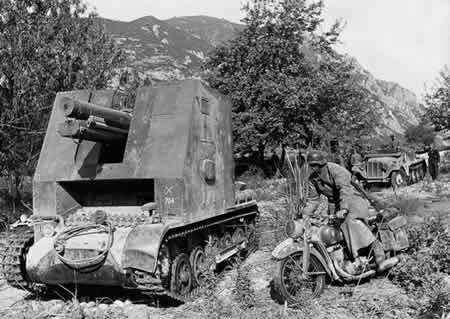 The vehicles from left to right are: a sIG 33 (basically a mobile 150mm howitzer), a DKW NZ350 solo motorcycle and an SdKfz 10 halftrack with, judging by his black panzer uniform, one of the sIG 33’s crew standing beside it. The sIG 33, because of its box-like body and high centre of gravity plus the Panzer Mk I chassis not really being strong enough, certainly had its drawbacks. 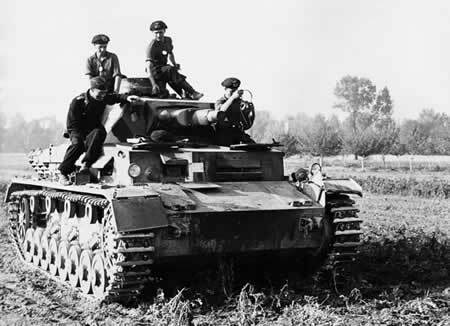 But it was improved when refined and mounted on a Panzer II chassis. May 1940. 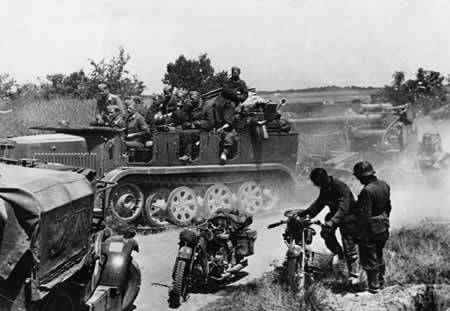 An 88mm gun model Flak 18 and crew pass Wehrmacht motorcycles (a BMW R18 and a DKW NZ350) alongside a British Morris C8. The Germans made use of captured vehicles of all kinds, sometimes for jobs they were not designed to do. The 88mm gun is an early model with single front wheel and double rear wheel SdAnh201 trailer. The tractor unit is a ubiquitous Krauss-Maffei SdKfz 7 halftrack. The gunner in the right rear seat is holding a traffic control stick with red or green disc, which is still in use today with the German Army. 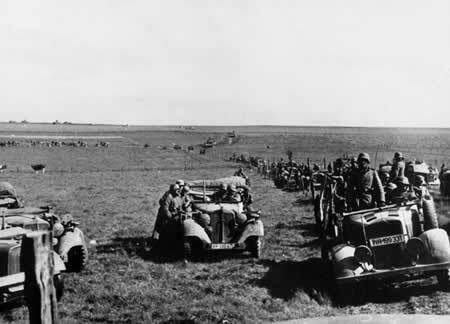 The 4th Panzer Division on the move: soft-skinned vehicles lead Panzer IIIs through the French countryside, 17 May 1940. Here can be seen some of the variation in vehicular transport used by the German Army in World War II. Identifiable are types from Stoewer, Horch, Phanomen and Opel. A Wehrmacht tank crew in their Panzer IV relax and have a smoke and a chat. Four of the five are wearing the typical wide panzer beret (Schutzmütze), prevalent early in the war, the fifth, on the left, is wearing a panzer black uniform (often confused with the SS uniform), short ankle boots (Schnürschuhe) and a service cap (Feldmütze). Two other points visible in this picture are the personal identification tags showing outside of the shirts of the two tankman on the turret, and the early war plain white cross on the frontal armour of the Panzer IV. Crete, May 1941. A Fallschirmjager mortar team head off one way as their comrades take another path. 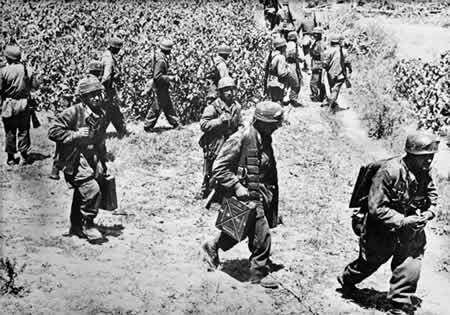 Crete was the last major air drop carried out by these elite Luftwaffe troops due to the severe losses suffered. Earlier campaigns in Norway and the Low Countries were very successful for these brave fighters. Later, they fought well as infantry on the Eastern Front and in Italy, especially during the attacks on Monte Cassino in 1944. Note their close-rimmed helmets, parachutist ankle boots, camouflaged and loose-fitting smocks and one-colour trousers. The man nearest the camera has a pair of goggles around his helmet. Light armour and soft-skinned vehicles of Panzer Group Guderian (General Heinz Guderian, the famous panzer general) pass through the streets of a French town, May 1940. 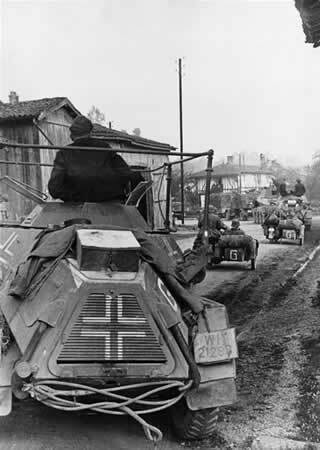 The SdKfz 222 nearest to the camera has a cradle of radio aerials around its turret. Further down the convoy, minus antennae, is another SdKfz 222. The motorcycle combinations are BMW R12s. In front of the furthest 222 is an eight-wheel SdKfz 232 heavy armoured car. The nearest truck appears to be an Opel Blitz. One can perhaps appreciate the fear in any town that accompanied the invasion of such a force.